The Middletown [EMT12] - $809.00 : Gas Light Conversion to LED!, Looks like a Gas Light! 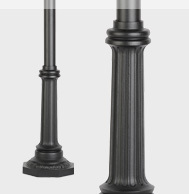 The Middletown lamp post features a flattering octagonal base with classic detailing. It can be paired with the Street Lights and our Gas Light Conversion Kit.